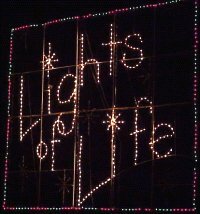 Each year in Marietta, Georgia, Life University, a chiropractic school, holds a massive holiday light display on their grounds. James found out about it from a co-worker one Christmas season when I was in an emotional funk and took me to see it; it's now an annual tradition. If you're in the area, come out and enjoy this feast for the eyes. The display costs $10/carload to defray power costs.